Mali Mish - Day 69: The peak of autumn in Brighton, Michigan. 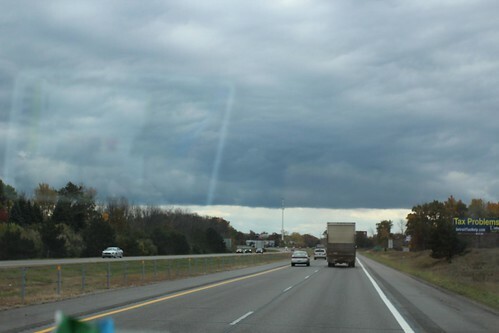 Our southern trek continued on today as we are headed towards southeastern Michigan. We are headed into the Ann Arbor/Detroit area for a few days. We have a couple of friends that live in the area and we planned on spending some time with each of them while we are there. One of them is someone I worked with but have never met in person. The other friend is a former co-working of Marlene’s that use to live in Ventura but decided to move back to the mid-west to be closer to family. They both have young kids so it will be pretty cool for Ava and Mila to play with them during our visit. 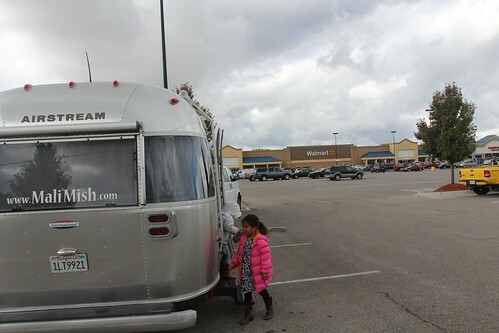 As we headed south towards Ann Arbor, we contemplated on places to stay. After reviewing some options via the Internet, we decided to check out a state park in Brighton, Michigan. Brighton is a town about 20 miles north of Ann Arbor. 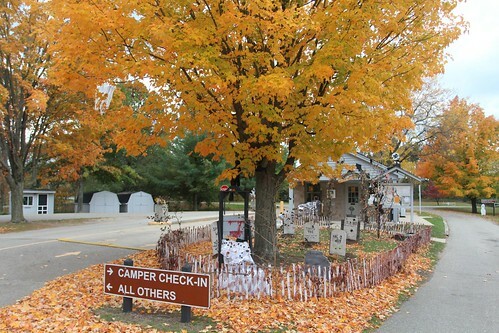 When we got to the campground, we noticed that they have the place all dressed up with Halloween decoration. The fall colors are now in its peak. 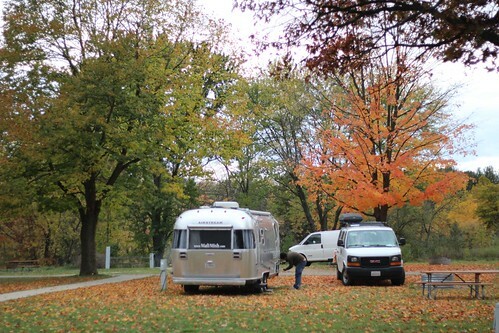 We are seeing some of the most unbelievable autumn sights as we pulled into the campground. 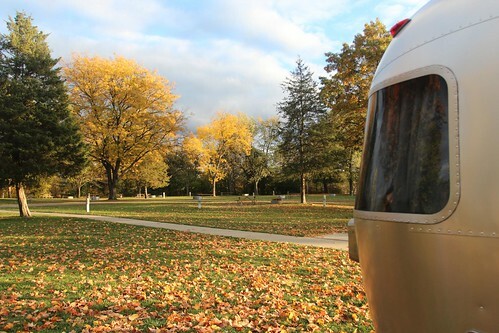 This weekend, this campground is expecting a full house because they are having a Harvest Festival complete with trick or treating for the kids. 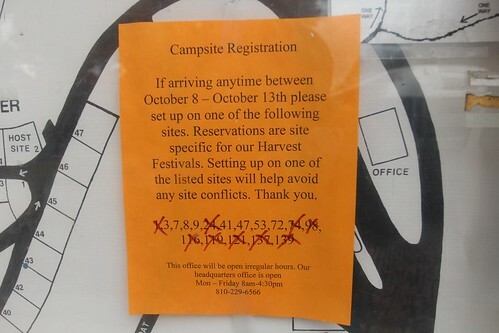 Of the 190 sites, there are only 8 sites left available for Friday and Saturday. If we want to stay through the weekend, we would have to get into one of them now. 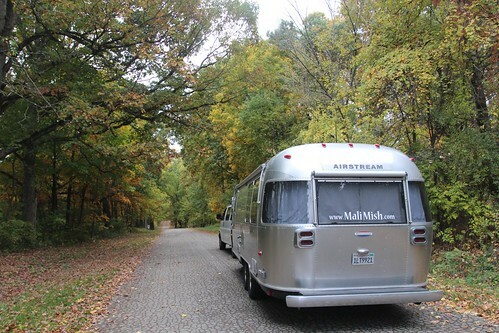 As we did our loop around the campground, we fell in love with yet another Michigan State Park. There are no breathtaking sand dunes nor are there views of the Great Lakes. 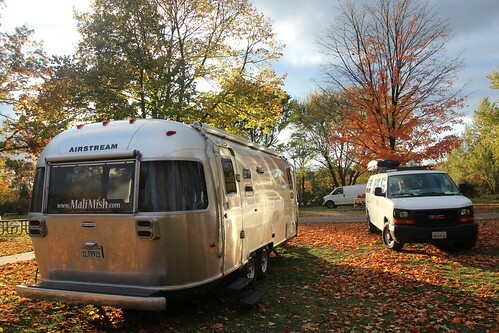 We felt a tingle in our hearts about this campground for the sole reason that we are here at the best time of the year to be in Michigan. 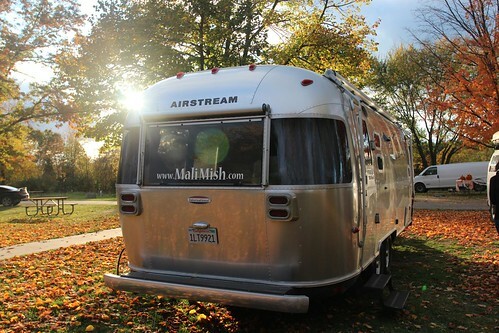 There are fallen leaves all over our site and the sound of them crinkling as we backed into our site was heartwarming. 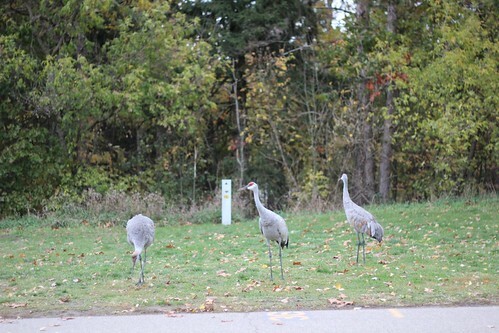 There was a family of three sandhill cranes that came strolling through our camp. 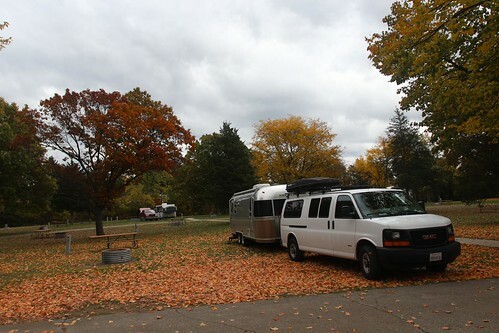 The sites are spacious and the one we picked was blanketed with red and yellow leaves that had fallen from the tree from the right of this picture. I suspect before we leave here, that tree will be close to bare. As the sun started to set, the amazing colors of the leaves looked even more amazing. We couldn’t believe our eyes. There are two hours a day that cinematographer and photographer like to refer to as the golden hours. The one just before sunset and the other just after sun rise. During these hours, the suns rays are diffused and warm and produce some of the most visually stunning images. Just as we approached the afternoon golden hour, the clouds cleared just enough for us to take advantage of the incredible lighting to capture the colors of the leaves as it peers through the cool autumn breeze. As the sun was settling itself back behind some clouds, we were able to capture just a few lens flares by partially covering it with the edge of the Airstream. 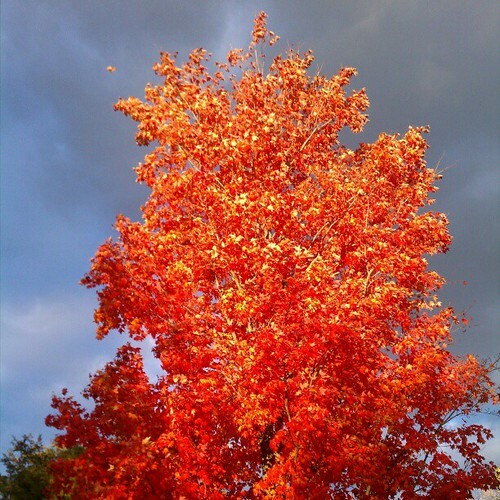 We were headed out to town to do some laundry and to grab a bite for dinner, as we passed the entrance to leave the campground, we captured this tree with bright red leaves as the sun was directly shining on it. It was like nothing I have ever seen before. Tonight, we are keeping it classy all the way. 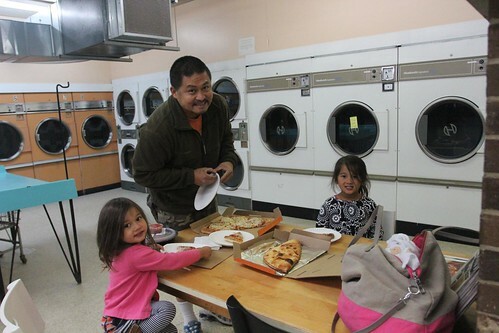 Pizza for dinner at the laundromat. 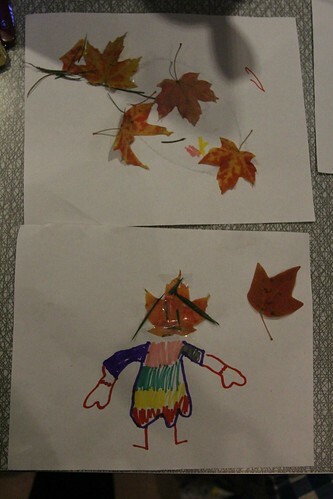 While the girls waited for laundry to get done, they created their own artwork inspired by the midwestern autumn. 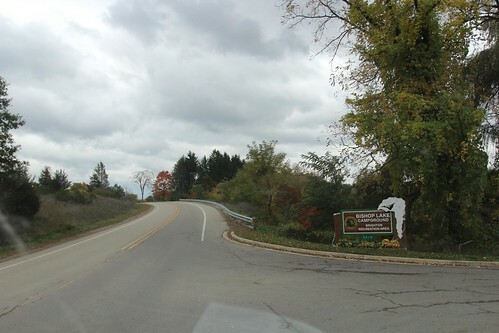 2 Responses to Day 69: The peak of autumn in Brighton, Michigan. get out of the cold ASAP – we froze out tuckies in the high desert a few times. . .also I’m cranking up a mobile design/living blog towed abode – towedabode.typepad.com I hope to clean up that URL in the near future! Also I upgraded to a Cradlepoint MBR95 which gives you true router capabilities – very reliable too! cheers and keep on keepin’ on ! Beautiful fall pictures. We made it home and all is well. Fall is almost peak here, probably one week from full color.